For Raman Subba Row, the fourth cricketer of Indian origin to play for England, returning to the Cricket Club of India in Mumbai was a nostalgic experience. "October 8, 1953," he recounts, "that's when I came to the CCI with the Commonwealth team." Eager to revisit the past, Subba Row also sported the same tie he had worn when he first came to the club more than 51 years ago. 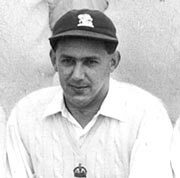 Subba Row played 13 Tests for England, but became more famous as a match referee. During his tenure (1991 to 2001), among many things, he penalized Australia fast bowler Glenn McGrath for spitting at West Indies batsman Sherwin Campbell, sent Aussie keeper Ian Healy home for showing dissent and officiated the infamous India-South Africa series in 2000. Subba Row, 72, on vacation in India, spoke to Cricket Correspondent Deepti Patwardhan about his Indian roots and his involvement in the game as a player, administrator and official. Can you tell us about your connection with India? My father originally comes from Andhra Pradesh, from a little village called Bampatla on the coast, which I think has had some damage during the recent tsunami. It is near a place called Chirala, which was the home of the Indian Tobacco Company. At a very young age my grandfather sent him to a university in Ireland, in 1913. He did four years at Dublin University and got his law degree. Then he retraced his steps back to England. He was there for a short time and during that short time he met my mother. He brought his English bride back to India. He practiced in Chennai, Madras at that time, as a barrister for the Privy Council for three years during which my two elder brothers were born, and then in 1920 they returned to England. Sadly, my eldest brother died in a car accident before I was born and I think I am just a replacement for him. But I have come back to my father's village three times now. It was very nice to meet the people there. When you were born, the freedom movement was brewing in India. Did it affect Indian families in England? No, living in the UK we didn't see much of it. My father was president of the Indian social club in London, but we weren't really affected by what was happening in India. Did you ever contemplate playing Test cricket for India? I always enjoyed the association with India, but having been born and brought up in England, and lived through that awful war, with the bombing and all that, you just get very anglicised. I have never forgotten my Indian connections and I am very lucky to have friends in both parts of the world. But having grown up there you become a part of the English culture; going to university and playing English cricket. I also went into the Royal Air Force for two years when all the youngsters had to do what they called the National Service, played cricket that summer and then went on to play for England. Do you regret not playing a Test in India? It would have been lovely to play here (in India), but it is just that a tour didn't coincide when I was playing. 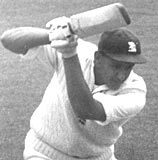 I played against India in 1959 at the Oval; I got close to a century then (he scored 94). It was always nice to talk with the players from India. I first met the Indian team just after the war. The Indian team was the first to come to England after the war (World War II) in 1946. People like (Vinoo) Mankad, (Vijay) Merchant, (Vijay) Hazare and the Nawab of Pataudi (Sr) were there. My father took me to a place called Hastings at the end of the day's play and I shook hands with all of them when I was 14. So it was a lovely experience. Why did you retire after playing just 13 Tests? I did two tours, to Australia (1958-59) and West Indies (1959-60). I retired in September 1961 to get down to some proper work. In those days we had amateurs and professionals and the amateurs were not paid. I didn't want to pursue cricket as a profession; I wanted to do other things. I was lucky to do other things. I went to University (Cambridge) for three years and then to have the accountancy training for three years. I had got married and we had our first baby, so I thought that was the time to settle down. What brought you back to cricket? I finished in 1961, then had no connection with cricket at all. Later on in the sixties Surrey invited me to go on their committee. In 1968 they invited me to become the chairman of Surrey; I did that for five years. I remained involved in Surrey cricket. Two or three of us started public relations and a marketing sub-committee, which wasn't there before in any of the counties. We had the first advertising sign at the ground (at The Oval), one of our clients in the insurance company. It was the only sign at the far end. We got in touch with the MCC (Marylebone Cricket Club) then and started a marketing sub-committee there. It was a very good experience and got me involved in English cricket. In 1985 I was invited to be the chairman of the ECB (English Cricket Board), the Test Cricket and County Board at that time. I served there for five years (1985 to 1990). During the latter part of my chairmanship, the MCC, which used to look after the International Cricket Conference, said there should be a separate body for international cricket. I was on the committee that suggested that there should be the International Cricket Council, and Colin Cowdrey was made the first chairman. You came to India frequently as a match referee. I was the match referee here (India) in 2000 when South Africa toured here last. There were strange things I couldn't understand. It was the start of match-fixing, which actually went back to 1993-94, during the tournament involving India, West Indies and New Zealand. There was evidence of it then. When you have a team who plays for a draw and loses, you have to doubt. I wouldn't like to stir things now but there were lots of things going on and I spoke to the captains. The ICC should have tackled things more professionally then, but they didn't. Do the referees have a more vigilant role to play after the match-fixing episode? Absolutely. The referees have a job to; they have to see that the game is conducted properly, make sure that there is no match-fixing that they can see. They also have to see that the game is played in the right spirit. And if the game is not played properly then you have to take some action. You can't just leave it. The match referee is responsible for the game once the match is handed over by the ICC and the groundsman. There are some instances when you can see that the player has clearly crossed the line and you have to intervene. The whole world has also seen it; lots of kids are seeing them (the players). You have to be competitive without being unpleasant. It has gradually got better than, maybe, five years ago. Are financial penalties for player misconduct effective enough? No, I don't think they are, especially since they are an irrelevant amount of their earnings that they, if not their (respective cricket) boards, pay. The only proper penalty for misconduct would be a match penalty. Everything evolves and in future you could see runs or points taken off. I personally don't like fiddling with scores. If somebody misbehaves he has to accept a financial penalty or match ban. There have been accusations of racism against some match referees. The issue blew up in India when Mike Deness fined seven Indians, including Sachin Tendulkar, for excessive appealing. Do you agree with the charge? I heard some muttering once. Most of them (referees) are past cricketers and they are not racist people. I haven't come across any such instance. People may have come to that conclusion for not the right reasons. Mike Deness is not racist; what he did may have been a judgmental error. But I don't think it was a racist decision. I have known Mike for far too long. He might be anti-white (laughs). It is a question of judgement. There isn't anything written down and one match referee's judgment maybe different from the other. Just as it happens in court, no two judges give the same decision, although they have the same set of guidelines. You have to take a view; that's your job. Should the match referee or the third umpire given the power to overrule the umpires' decision? I think once the umpire has given the decision that should be it. What I do think we should make use of is the television. If the umpire is not sure about anything he should not be afraid to ask for its help. It should be quick; you don't want interminable delays. There are times when the whole world knows ten seconds later that the umpire has made a big mistake. That can be avoided. The game belongs to the umpire, but there are certain times when they can be assisted. Recently, the ICC Appeals Commission was called in to resolve the issue between Clive Lloyd and Sourav Ganguly. Did the commission's decision undermine Lloyd's authority? When the match referee imposes a penalty that should be it, unless it is clearly seen that the referee has got it wrong. This particular occasion he hadn't got it wrong; it was a simple calculation. And I don't think it should ever go to the appeals commission. I don't think the commission should be used for measurable occurrences. You were on the committee that proposed the elite panel of umpires. How has the standard of umpiring improved? It has improved the standard of umpiring. Not only that, now in the Test matches you don't get home umpires. So the temptation to say that the umpire is biased because he is of that country is not there. I think that's a big step forward. But I think the umpires are too few in number and the amount of cricket being played puts them under too much pressure. You need to have enough of the best people around.